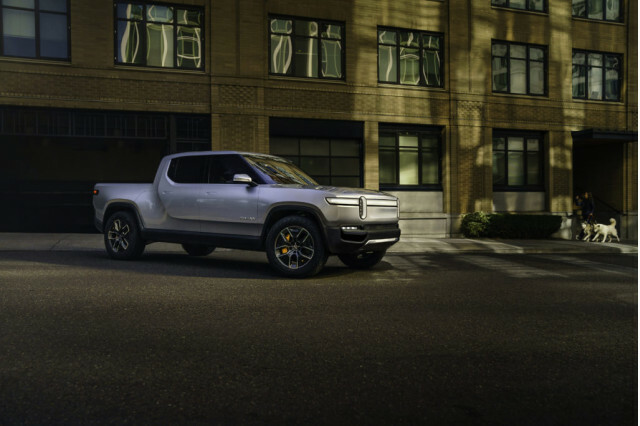 With the Rivian R1T pickup revealed this morning, just ahead of the Los Angeles auto show, and the R1S SUV expected to be shown here this week, a Michigan-based electric-vehicle startup called Rivian might have something that’s been a long time coming: the first widely available fully electric light-duty pickup. Along with that, it might have the first battery pack significantly larger than what’s used by Tesla, the most power and torque ever in a normal-production light truck, and the first vehicle that can be DC fast-charged at more than 150 kw. The trucks that Rivian is revealing this week are loaded with great ideas and what appear to be effective designs, but it serves to cage all this with plenty of coulds or mights as they’re still far from production-ready. At about two years from first deliveries, all those boasting points are in the hypothetical realm—because they depend on Rivian’s ability to produce its trucks at a former Mitsubishi (and Chrysler) facility in Normal, Illinois, and then support those products. We’ve seen Faraday Future, for instance, come farther—a lot farther, actually—and they still didn’t quite make it. The product, if it arrives looking and performing as billed, would be a welcome way for truck people to go tailpipe-free. The R1T is 215.6 inches long, roughly the length of today’s so-called mid-size pickups. But its 79.3-inch width and 135.8-inch wheelbase are more in line with full-size trucks. Factor in the 55-inch bed length—short, even by mid-size truck standards—and the result appears to be a very spacious passenger cabin. Visualize a truck built to appeal both to the Tesla set and the crowds who buys GMC Denali trucks and have a Range Rover in the driveway, and you won’t land too far away from the R1T’s look. The trucks “have been designed to communicate strength and refinement while still inviting customers to get them dirty,” said the vehicle maker. There are a lot of parallels to Tesla in the strategy. The R1T is offered with several possible battery packs, each with correspondingly longer driving ranges. And not all of them end up offering the same performance. 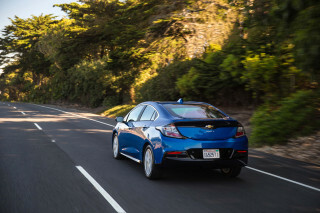 With the initially available 135 kwh and 180 kwh battery packs, four motors will each be rated up to 174 horsepower. Just as with Tesla, a lower-priced version with a smaller 105-kwh battery pack and lower 402-horsepower (300-kw) total (combined) motor output will join the lineup later—within a year of launch, Rivian says. Rivian's range estimates at this point are more than 300 miles for the 135-kwh, more than 400 miles for the 180-kwh, and 230 miles for the 105-kwh. The total of 820 pound-feet of torque in models with the larger battery packs, is bested only by the bigger diesel V-8s offered in heavy-duty pickups. With an 11,000-pound trailer-weight limit it will be able to put that torque to good use there, or in off-road tasks like climbing up to a 45-degree gradient, fording 39 inches of water, or handling serious off-road trails with Jeep-like off-road and departure angles. Acceleration from 0-60 mph—or again, to cage this, the projected acceleration of a future vehicle—is astonishing. 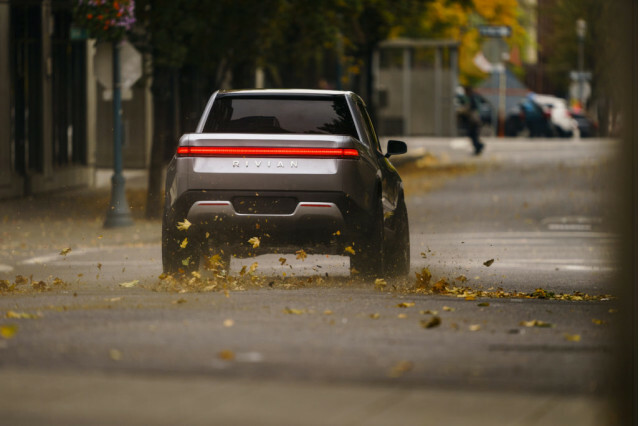 Rivian claims just 3.0 seconds for the 135-kwh model or 3.2 seconds for the 180-kwh model; the 105-kwh will still be able to get to 60 mph in 4.9 seconds. 100 mph comes in less than 7 seconds for the 135-kwh version (less than 8 seconds for the 180-kwh), and top speed is 125 mph. The R1T has been designed for some very fast charging. It will use CCS DC fast charging at up to 160 kw—which would allow up to 200 miles of range gained in 30 minutes. The onboard AC charger is a higher-power 11-kw unit. Rivian is currently listing a single curb weight—5874 pounds—for all three versions. The 180-kwh version is obviously going to weigh many hundreds of pounds more than the 105-kwh version. And that in turn could significantly change specs for the production model. The R1T’s squared-off shape, with a sheet metal crease that frames out the cabin and wheel wells, doesn’t stray too far from current convention. The front and rear styling is distinctive, with a clean horizontal bar for both. The charging door is at the front right corner of the vehicle. The cabin is described as “a premium environment that conveys craftsmanship yet invites rugged, daily use.” It’s trimmed in natural-finish, sustainably sourced wood, and Rivian claims to have paid a lot of attention to color and materials. 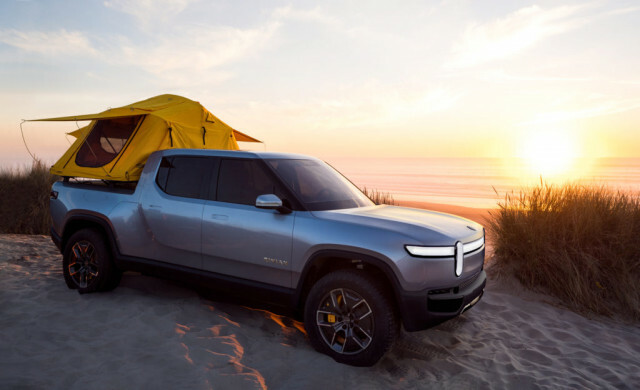 With its target buyer in mind—outdoor enthusiasts, rather than the traditional construction-site-and-contractor set—Rivian has made space for lots of gear. A lockable Gear Tunnel is just behind the cab, extending across the vehicle and providing 12.4 cubic feet of long storage for golf bags or a surfboard, for example. 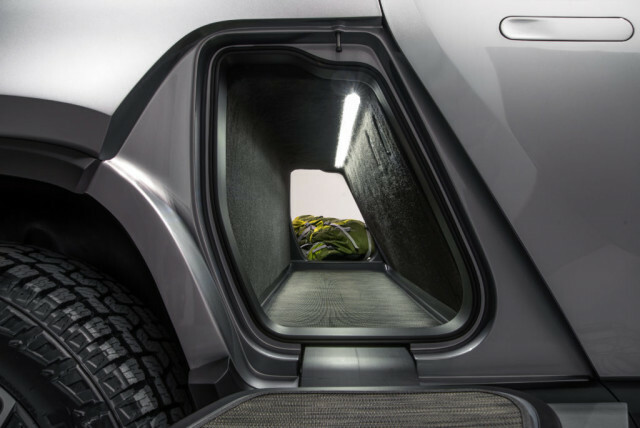 Steps help with roof loading, and a Gear Guard feature uses two integrated locking cables, monitored by a bed camera and a feature that alerts owners if contents are removed. A ‘frunk’ holds a substantial 11.7 cubic feet—depending on its shape, good enough for two carry-on suitcases. Can they deliver...answers to so many questions? Unlike Bollinger Motors, which is developing a heavy-duty Class 3 truck, Rivian will need to put its vehicle through the full battery of federal crash tests. 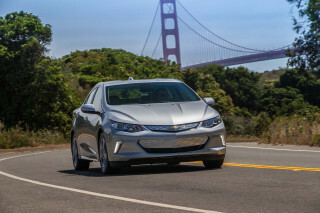 It claims that the vehicles will deliver top ratings from the IIHS and NHTSA, and with self-driving sensors on board there will be several active-safety features. With Tesla's record to cite, luring in reservations based on a low target price is the best and worst way to approach such pent-up demand. 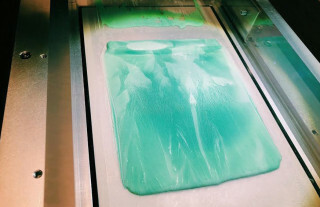 Rivian is aiming for an attractive base price of $69,000 ($61,500 after the federal tax credit), and it previously pointed to a price of about $90,000 for the top-trim version. 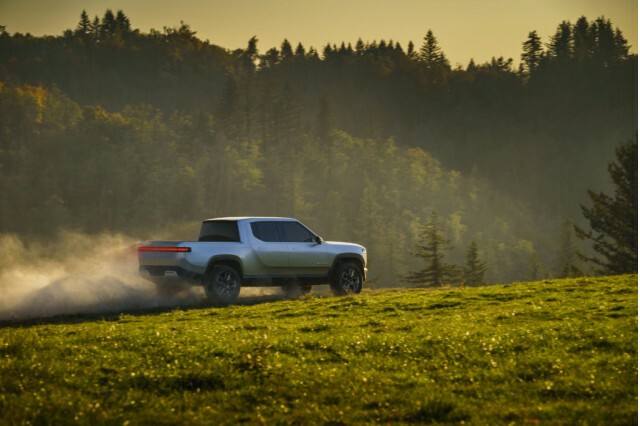 It plans to start deliveries in late 2020 for the R1T pickup and early 2021 for the R1S SUV and is taking $1,000 deposits. The company is expected to reveal further details about the R1S at the LA show, so check back for more on that and the missing pieces—like, for one, how a brand with no presence yet plans to sell and service such a truck.